Then one puts on the lid. I have cut a hole towards the edge of the lid allowing for the entry of the immersion heater. Preferably use an electric drill, otherwise it is easy to split the lid. 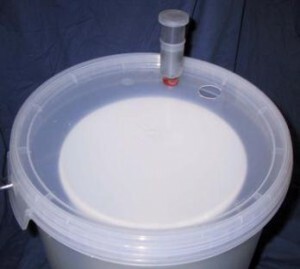 The reason for using a fermentation lock is that the air in the container will expand and contract a little, depending on the temperature of the surroundings. If you use a fermentation lock with activated carbon the distillation will be completely odour free, use no water in the fermentation lock, only activated carbon. The immersion heater is bought in a pet shop. 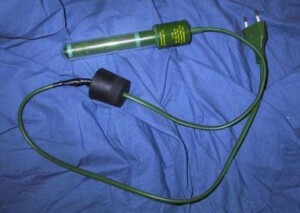 Normally used to heat a fish tank, and is available in various sizes and wattage. There are several different types of immersion heaters that work well with this apparatus. Unfortunately most of the units sold in pet shops are unsuitable. Nearly all heaters have an integral thermostat. A thermostat is for regulating the heat of the water. You set the temperature required and the immersion heater then holds this temperature in the water. Unfortunately nearly all thermostats have a maximum setting of 32 degrees C. This heat is too low and it would take forever to produce anything. A suitable temperature range for this unit is 45 – 52 degrees C. Buy an immersion heater with a thermostat that goes up to 55 degrees C.
www.partyman.se supplies a thermostat-controlled immersion heater of 100 watts, 22 – 55 degrees C. This unit is for fermentation in cold areas as well as to hold the temperature when using enzyme treatment of dried and fresh fruit (45 – 50 degrees C) when making wine. It functions very well.